Expertly authored questions provide comprehensive, concise review of 100% of all CompTIA Network+ exam objectives. This certification validates skills equivalent to nine months of practical networking experience; those earning the Network+ certificate will have the skills needed to install, configure, and troubleshoot today's basic networking hardware peripherals and protocols. 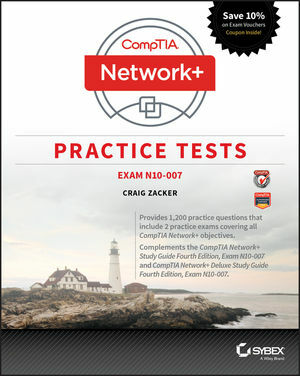 CompTIA Network+ Practice Tests (Exam N10-007) offers 1200 practice questions with answers and explanations, organized into 5 full-length chapter tests, PLUS 2 practice exams, and a year of FREE access to the online test bank. Coverage includes: Network Architecture; Network Operations; Network Security; Troubleshooting; and Industry Standards, Practices, and Network Theory. It’s the ideal companion to the CompTIA Network+ Study Guide, CompTIA Network+ Review Guide, and CompTIA Network+ Deluxe Study Guide for Exam N10-007! This book helps you gain the confidence you need for taking the new CompTIA Network+ Exam N10-007. The practice test questions prepare you for test success. CRAIG ZACKER, is the author or co-author of dozens of books, manuals, articles, and web sites on computer and networking topics. https://www.efficientlearning.com/comptia-network-plus/ Sybex CompTIA Network+ Exam Review Courses Available!